Like this image, think you can do better, vote for it here? The Eclipse Foundation participates in Google's Summer of Code. Thank you for your interest in Eclipse. Eclipse is a great place to spend a summer learning, coding, participating and contributing. We are an exciting open source project with a vibrant community, and we look forward to your application and your project ideas. A good way to meet those involved with the program is to participate in the mailing list, or visit the #eclipse-soc and #eclipse IRC channels on Freenode. See also Google Summer of Code for Mentors. The program is administered by Ahti Kitsik, Philippe Ombredanne, and Wayne Beaton. It's best if you use the public communication channel whenever possible; however, if you need to communicate in private, please feel free to send Wayne a note. 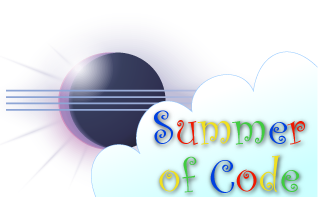 Google has announced the 2011 Google Summer of Code program. Be sure to acquaint yourself with the timeline, and make sure that you do what you need to do in a timely fashion! You can find accepted projects for this year and watch their progress at GSoC 2011 page. Every Eclipse Project appreciates input. We recommend that you take a look around Eclipse to see if there is anything you find particularly interesting. If you do find a project that you're interested in, take a look at their bugs to see if there are any problems that you feel you can solve.